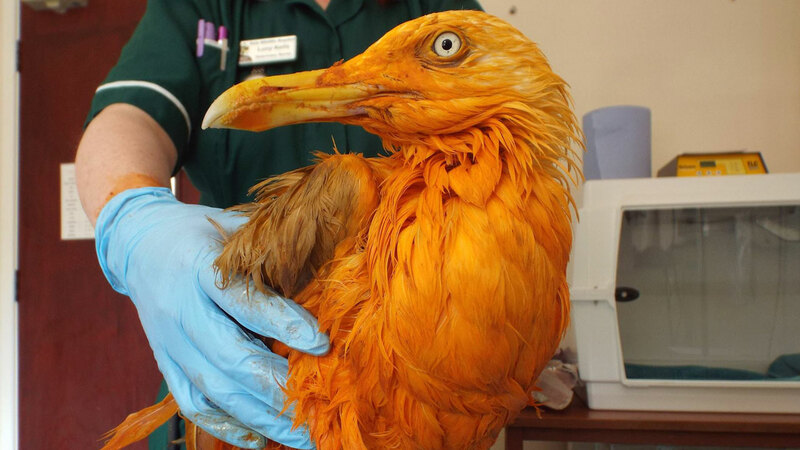 BECKFORD, ENGLAND (KTRK) -- Unlike the people who lighten up their hair color as summer approaches, one unlucky seagull didn't intend to give himself an all-over dye job -- it just kind of happened. As ridiculous as it may seem, the unlucky seagull was trying to grab a snack when he reportedly fell completely into a large vat of curry. Veterinarians at the Vale Wildlife Hospital & Rehabilitation Centre in Beckford, England managed to scrub down the bird with dish soap, and say that it is recovering nicely. "I don't think any of us have experienced such an orange greasy gull to deal with before... but boy did he smell good!" Lucy Kells, a veterinarian who cared for the gull, quipped in a Facebook post. "Hopefully he'll stick to a much more bland diet in the future!" she added.